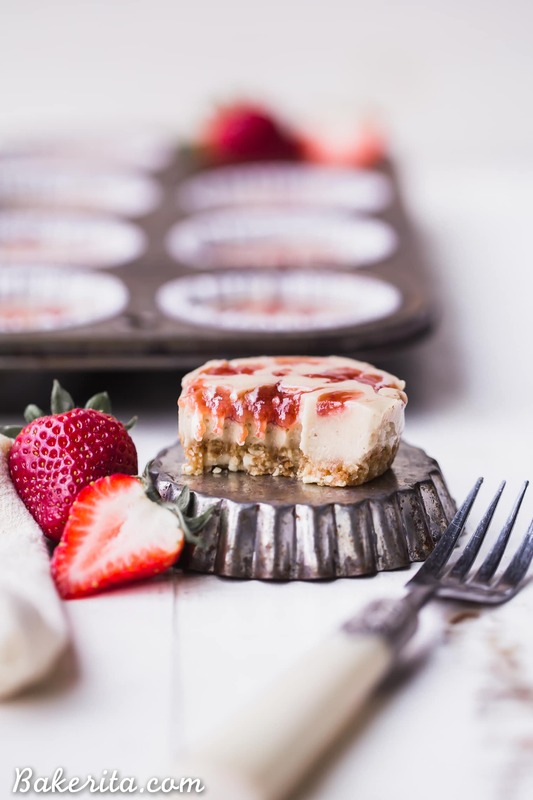 These No Bake Cashew Butter & Jelly Cheesecakes are sweet individual desserts that are lusciously creamy, simple to make, and swirled with strawberry jam. 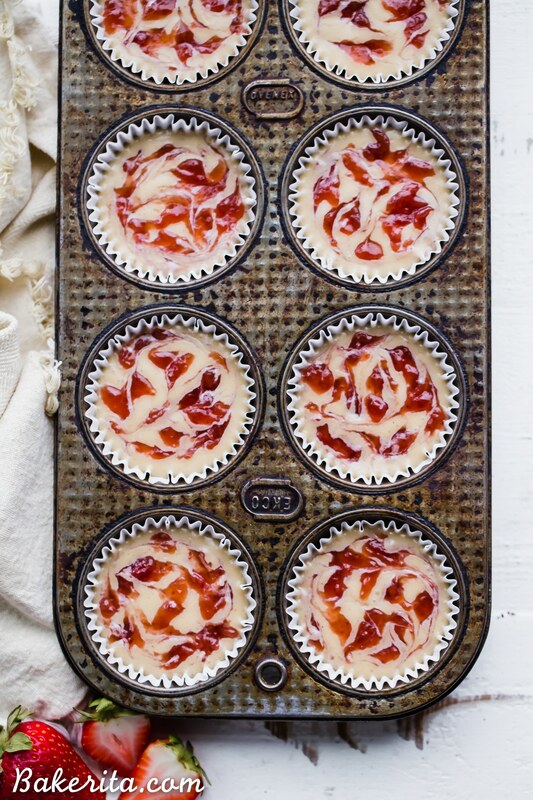 You can customize them with your favorite nut butter and jelly to make them your own! They’re gluten-free, paleo and vegan. This post is sponsored by iHerb.com. What better way to start the day than CHEESECAKES?! I don’t know that there is one…except maybe cheesecakes that are actually gluten-free, paleo, and VEGAN?! Yeah, I’m thinking that might be the winner. 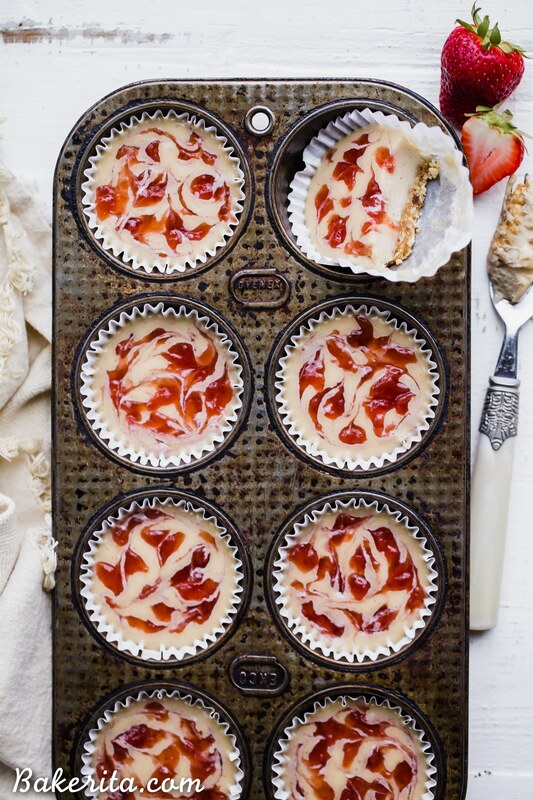 These little Cashew Butter & Jelly Cheesecakes come together in a flash too…maybe a little longer if you’re a psycho like me about making sure the crusts are perfectly even but that’s for ~aestetics~ and totally unnecessary. I got almost ALL of the ingredients needed for these little cheesecakes on iHerb.com. Have you heard of/shopped from iHerb? It’s pretty dang awesome if I do say so myself. It’s like shopping the middle aisles of Whole Foods at a discount – you can find all your fave snacks and vitamins and baking ingredients. You can browse by brand or category to stock up on all the faves! One of the most amazing things is that they carry over 5,000 grocery products and ship to 160 countries (!!!!) so for all my international friends out there who are always telling me you can’t find the products I use…you can find most of them on iHerb and get them shipped straight to your door! Their customer Service team also provides support in 10 languages. 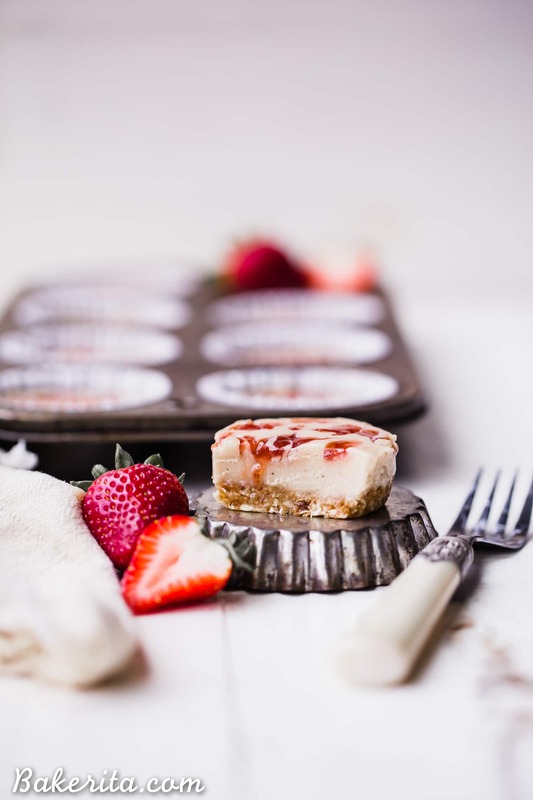 Now let’s chat about all the goodies I used to make these glorious little Cashew Butter & Jelly Cheesecakes! To start, you’ve got to make the SUPER SIMPLE crust. It’s just two ingredients, pitted Medjool dates and cashews. If you opt for a different nut butter in the filling, you can use the corresponding nut/seed in the crust too. Now, the filling. This is DIFFERENT than most of my other no-bake cheesecakes because,for those, I usually use soaked cashews. Here, we’re taking a shortcut – no need to soak the cashews, we’re going straight for the CASHEW BUTTER. 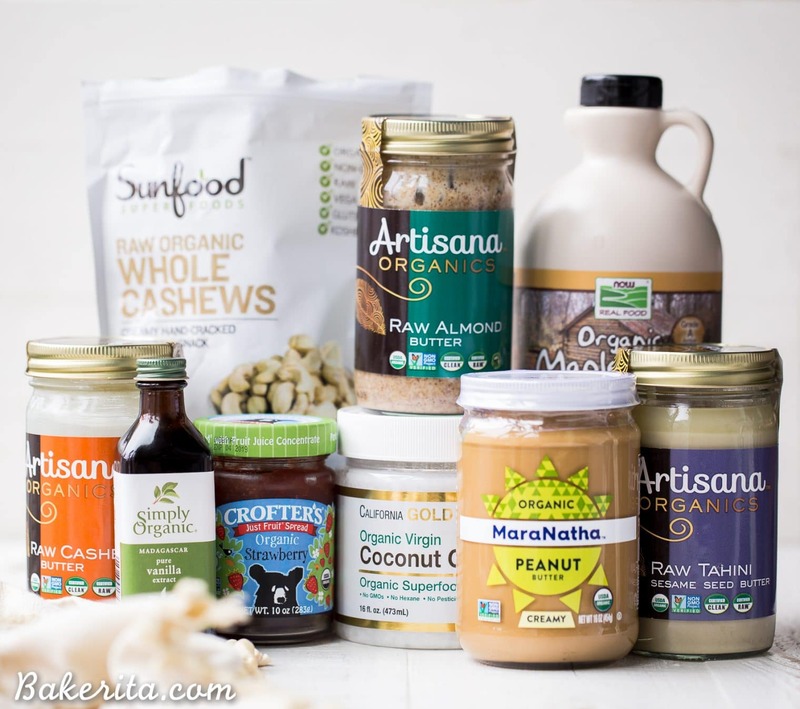 I love the subtle buttery sweetness of raw cashew butter, but be creative here. 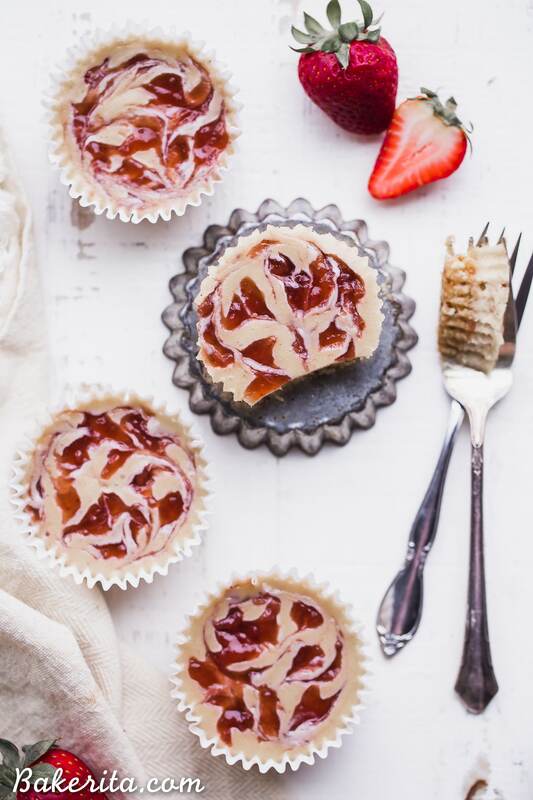 You can make them into almond butter & jelly cheesecakes with raw almond butter, keep it classic with peanut butter, or even make things totally nut-free with tahini or sunflower seed butter! The cashew butter (or whichever nut/seed butter you choose) gets blended up with organic maple syrup for some sweetness, and canned coconut milk and coconut oil, which both help the cheesecakes firm up and stay super creamy. A splash of vanilla extract adds an extra touch of warmth to the flavor. I hope you’ll give these bites of creamy goodness a go – I highly doubt you’ll regret it…! When you do, let me know your favorite nut butter/jelly combo – I’m thinking almond butter & raspberry jam would be outta this world. Enjoy, my friends! New customers can get a 5% discount off their iHerb order by clicking here. New customers can use Promo Code, WELCOME5, to get an additional $5 off their order of $40 or more. 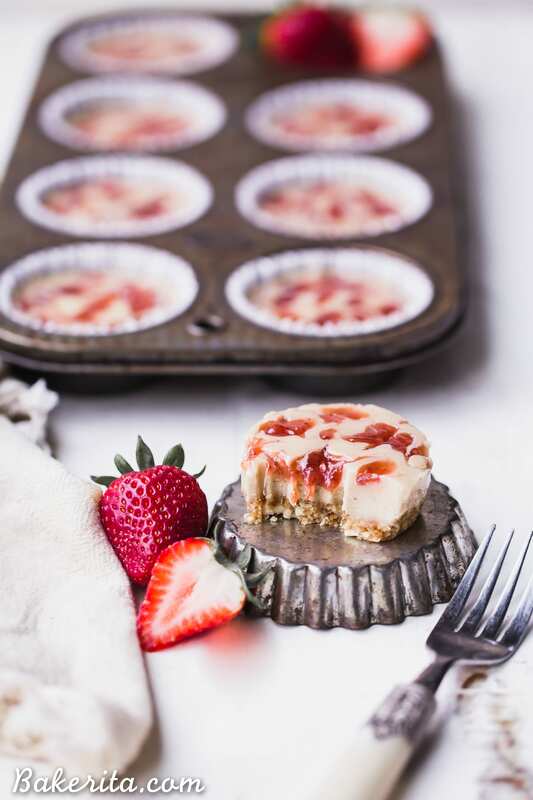 These No Bake Cashew Butter & Jelly Cheesecakes are sweet individual desserts that are lusciously creamy, simple to make, and swirled with strawberry jam. You can customize them with your favorite nut butter and jelly to make them your own! They're gluten-free, paleo and vegan. For the crust, combine the cashews and pitted dates in a food processor or high powered blender and pulse to combine and break up the cashews into smaller bits. Pulse to combine, until the cashews have broken down considerably and everything sticks together. Divide evenly between the pans (I used a heaping tablespoon for each) and press into the bottom. Set aside. In the same food processor or blender (no need to wash between), combine all of the ingredients in the filling except for the fruit preserves. Turn the food processor or blender on medium-high and blend for a minute, or until the mixture is silky smooth and creamy. Divide the filling between the prepared crusts. Dollop a teaspoon of jam onto the top of each and swirl into filling - you can also just add a layer of jam on top if you prefer! Place in the refrigerator for at least 2 hours to set completely before serving. Serve chilled, and keep any leftovers in the refrigerator (or freezer for longer storage). Thanks so much for the love Brittany! Hi there! I am planning on making this tonight but I am curious about the double cashew (one raw and one butter)– in your recipe you have the raw cashews for the filling and then the nut butter as well? Would you please clarify this for me? Hi Jacqui, I think you’re confusing the raw cashews, which go into the crust, not the filling. The cashew butter is for the filling. I added headings to divide the ingredient groups which should help clarify what goes where!